Sadly, I don't have any photos of the suifukin, an instrument which enjoyed a brief vogue during the early 1900s in Japan. It was invented around 1897 by Fujosuke Hiraoka of Tochigawa. 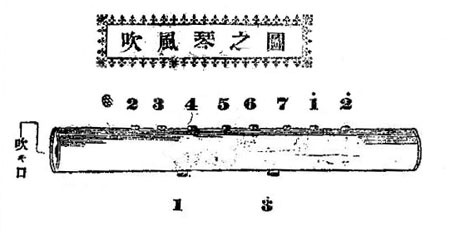 Rather than being derived from the sho (the Japanese version of the sheng), it seems to have been inspired by the harmonica, which was introduced to Japan towards the end of the 19th century. The construction of the instrument is quite simple. A metal tube with a blow hole at one end and closed at the other, has eight finger holes along the front and two thumb holes at the rear. Each hole contains a tube with a free reed fixed in slot in its wall. The player simply blows into the end of the suifukin and uncovers the hole that contains the note they want to sound. A suifukin in the key of C produced a C major scale covering an octave and a third from C to E.
This particular model has a pair of reeds for each note, tuned to produce a tremolo effect. Other versions of the suifukin had keys and resembled blow accordions. By 1907, there were four million of them produced annually, with many of them also being exported to China and Korea. The popularity of the instrument was such that more than a dozen books were published with playing instructions and tunes arranged in numbered tablature specifically for the suifukin, but by the time WWI came around, the instrument had been mostly forgotten. The commercially marketed version of the Harmonichord has a great deal in common with the suifukin, but there seems to be no direct link between them, the patent documents for the Harmonichord showing really quite a different instrument to the one that was eventually marketed. The recently invented fulusheng also works similarly.